A/V good. No cheating. A little choppy on the last part when fishing for eels but considering how much RNG is here it is not a big deal for me at. If we accept runner's estimate, then his time is right. Technically, the last thing the runner clicks is the newspaper on the case to show everyone the real events surrounding the King's death. The rest is skipping dialog. I would mark this run at 32:48 (because of segmented half-second penalty). This time the runner seems to have realized the using-cues-to-place-cursor-where-it-needs-to-be trick, although it's not quite as disciplined in the later segments. 2:00 - It's possible to get even luckier in this segment by getting the gem spawns closer to the dog but it's not too bad actually. 5:32 - few seconds lost. Hitboxes are weird. The correct thing (timewise too) would have been to collect the um umbrella after spawning it. 8:53 - still mouse problems? Maybe it's already getting fixed. 0:58 - Umm.... 3 seconds lost? 8:55 - Why not just move over a little bit? 11:58 - Why wait until Malcolm is over on the platform until reaching for the potion? Playing this was a very frustrating experience for me and it's cool to see it done so efficiently. I appreciate the shoutout in your notes as well. Leaving Kyrandia: No issues, portal potion seems to be the fastest path by a lot. Movement and inventory management are quick. -An ideal run would get 6 bones in the first three screens as you mentioned, but doing it in 4 is not much slower. I dunno how long you'd realistically want to grind for this if the bone drops are that rare. -Not sure what happened at 1:24? Accidentally grabbed the machete rather than the third bone? -Very fast machete work considering how stupid the hitbox for Malcom is in this section. It's incredibly easy to accidentally click him when you're trying to go fast and get killed by the blue snakes if they appear. -Seems like there's an extra plant chop here at 2:25, unless it's in the way of the next one. Very small time loss in any case. End of the World: I didn't see the lag issue you mentioned, unless it's when you're moving the umbrella really fast with the mouse cursor. Barely a second loss if so. Everything looks good here (in the run, anyway, the game looks horrible everywhere). -The Fish Queen is the worst thing in any adventure game I've ever played, possibly any game ever. -Some misclicks when stealing from the batfish's cave cost a few seconds and possibly an extra cycle. The luck here is still really good. -Rough movement delay on the screen following the dump, 0:58 in segment 3. Everything after that is fine. -Some misclicks when escaping jail, though as you mentioned, the game makes it very easy to destroy the necessary items by having Malcom eat them. -A few more inventory issues when getting the eels. Overall a very good run that could theoretically be improved by grinding for perfect RNG and cleaner mouse aiming. No issues with route or forgetting what to do. Easy accept. Congratulations to Andrew 'Bigmanjapan' Bondarenko! Game Page: Doesn't exist yet The Legend of Kyrandia 3: Malcolm's Revenge (pc) (pc) [Any %] [Segmented] [b]Verifier Responses[/b] [quote="mrprmiller"]A/V good. No cheating. A little choppy on the last part when fishing for eels but considering how much RNG is here it is not a big deal for me at. If we accept runner's estimate, then his time is right. Technically, the last thing the runner clicks is the newspaper on the case to show everyone the real events surrounding the King's death. The rest is skipping dialog. I would mark this run at 32:48 (because of segmented half-second penalty). Easy accept though. [/quote] [quote="LotBlind"]This time the runner seems to have realized the using-cues-to-place-cursor-where-it-needs-to-be trick, although it's not quite as disciplined in the later segments. 2nd seg 1:23 - 2 seconds lost 2:00 - It's possible to get even luckier in this segment by getting the gem spawns closer to the dog but it's not too bad actually. 5:32 - few seconds lost. Hitboxes are weird. The correct thing (timewise too) would have been to collect the um umbrella after spawning it. 8:53 - still mouse problems? Maybe it's already getting fixed. seg 3 0:58 - Umm.... 3 seconds lost? 8:55 - Why not just move over a little bit? 11:58 - Why wait until Malcolm is over on the platform until reaching for the potion? There's definitely some casualness to the mousework through the whole run but overall an easy accept[/quote] [quote="BaronHaynes"]First, thank you for running this terrible, terrible game :) Playing this was a very frustrating experience for me and it's cool to see it done so efficiently. I appreciate the shoutout in your notes as well. Leaving Kyrandia: No issues, portal potion seems to be the fastest path by a lot. Movement and inventory management are quick. Isle of Cats: -An ideal run would get 6 bones in the first three screens as you mentioned, but doing it in 4 is not much slower. I dunno how long you'd realistically want to grind for this if the bone drops are that rare. -Not sure what happened at 1:24? Accidentally grabbed the machete rather than the third bone? -Very fast machete work considering how stupid the hitbox for Malcom is in this section. It's incredibly easy to accidentally click him when you're trying to go fast and get killed by the blue snakes if they appear. -Seems like there's an extra plant chop here at 2:25, unless it's in the way of the next one. Very small time loss in any case. End of the World: I didn't see the lag issue you mentioned, unless it's when you're moving the umbrella really fast with the mouse cursor. Barely a second loss if so. Everything looks good here (in the run, anyway, the game looks horrible everywhere). Limbo: -The Fish Queen is the worst thing in any adventure game I've ever played, possibly any game ever. -Some misclicks when stealing from the batfish's cave cost a few seconds and possibly an extra cycle. The luck here is still really good. -Rough movement delay on the screen following the dump, 0:58 in segment 3. Everything after that is fine. Kyrandia: -Some misclicks when escaping jail, though as you mentioned, the game makes it very easy to destroy the necessary items by having Malcom eat them. -A few more inventory issues when getting the eels. -Good RNG from Herman. Overall a very good run that could theoretically be improved by grinding for perfect RNG and cleaner mouse aiming. No issues with route or forgetting what to do. Easy accept. [/quote] [b]Decision:[/b] Accept Congratulations to Andrew 'Bigmanjapan' Bondarenko! Thank you for verifing the run. Didn't see the bone right away. Was a mistake, should have taken umbrella first and then inserting second coin. Didn't occure in the run. If it occurs - that's a reset. The mistake here was an additional click on the transition point (triangles on the boarders of the screens). If you command Malcolm to move by clicking a transition point and then click transition point again, game will issue a 2-3 seconds cooldown between animations. This happened. I don't really remember how wide the walking area in that room, it is possible that you can't go right more. It sure possible to position Malcolm in a better way. Pegasus Potion triggers only while on platform. The main issue here was going away from the screen with batfish. Lying to him/getting coins and bating him out with items are not tied to each other, you can proceed with bating right after the last coins are picked up. I guess I thought about a good segmentation point, that's why I overlooked this. If admins reopen submission, I will upload new encodes. Edit: another thing I haven't mentioned in comments is that jester staff is not necessary to pick. I didn't expect to get 4 worms from the blind guy and planned to get 4th worm from fish teacher's apple by using jester. It turned out that in this run jester wasn't used at all. Thank you for verifing the run. [quote="LotBlind"] 2nd seg 1:23 - 2 seconds lost [/quote] [quote="BaronHaynes"] Isle of Cats: -Not sure what happened at 1:24? Accidentally grabbed the machete rather than the third bone? [/quote] Didn't see the bone right away. [quote="BaronHaynes"] -Seems like there's an extra plant chop here at 2:25, unless it's in the way of the next one. Very small time loss in any case. [/quote] My mistake. [quote="LotBlind"] 5:32 - few seconds lost. Hitboxes are weird. The correct thing (timewise too) would have been to collect the um umbrella after spawning it. [/quote] Was a mistake, should have taken umbrella first and then inserting second coin. [quote="BaronHaynes"] End of the World: I didn't see the lag issue you mentioned [/quote] Didn't occure in the run. If it occurs - that's a reset. [quote="LotBlind"] seg 3 0:58 - Umm.... 3 seconds lost? [/quote] The mistake here was an additional click on the transition point (triangles on the boarders of the screens). If you command Malcolm to move by clicking a transition point and then click transition point again, game will issue a 2-3 seconds cooldown between animations. This happened. [quote="LotBlind"] 8:55 - Why not just move over a little bit? [/quote] I don't really remember how wide the walking area in that room, it is possible that you can't go right more. It sure possible to position Malcolm in a better way. [quote="LotBlind"] 11:58 - Why wait until Malcolm is over on the platform until reaching for the potion? [/quote] Pegasus Potion triggers only while on platform. [quote="BaronHaynes"] -Some misclicks when stealing from the batfish's cave cost a few seconds and possibly an extra cycle. The luck here is still really good. [/quote] The main issue here was going away from the screen with batfish. Lying to him/getting coins and bating him out with items are not tied to each other, you can proceed with bating right after the last coins are picked up. I guess I thought about a good segmentation point, that's why I overlooked this. [quote="mrprmiller"]If we accept runner's estimate, then his time is right. Technically, the last thing the runner clicks is the newspaper on the case to show everyone the real events surrounding the King's death. The rest is skipping dialog. I would mark this run at 32:48 (because of segmented half-second penalty). [/quote] If timed from mouse pointer appearance to last click on the case then I agree with 32:48 timing. (without segmentation pentalty, it was canceled AFAIR) If admins reopen submission, I will upload new encodes. Edit: another thing I haven't mentioned in comments is that jester staff is not necessary to pick. I didn't expect to get 4 worms from the blind guy and planned to get 4th worm from fish teacher's apple by using jester. It turned out that in this run jester wasn't used at all. For games that let you save anywhere (i.e. without save points), a half second save penalty is added for each save. I went to the FAQ on the main site just before to check when I filled out that judge form; it is still mentioned, but we did have that conversation in the discussion thread and you are right. No half-second penalty. I know the SDA crew is looking at a redesign of some sort. Also, just for reference, the half-second segmentation penalty was removed a while back. Fantastic run, BTW. Getting out of Kyrandia that fast at the beginning was a highlight for me in itself. What I meant was you didn't reach for the potion until he was standing there, didn't get ready to grab it quickly. Or does it stop movement if you make the inventory show? Re. Jester's staff: Sounds like you could create a small knowledge base article for this game (honestly one page for the entire series would make sense) so the next person will know this. Or at least a forum thread. Unless you mean to redo this. [quote]Quote from LotBlind: 11:58 - Why wait until Malcolm is over on the platform until reaching for the potion? Pegasus Potion triggers only while on platform. [/quote] What I meant was you didn't reach for the potion until he was standing there, didn't get ready to grab it quickly. Or does it stop movement if you make the inventory show? Re. Jester's staff: Sounds like you could create a small knowledge base article for this game (honestly one page for the entire series would make sense) so the next person will know this. Or at least a forum thread. Unless you mean to redo this. You can trigger inventory to appear while walking but taking an object will stop Malcolm. 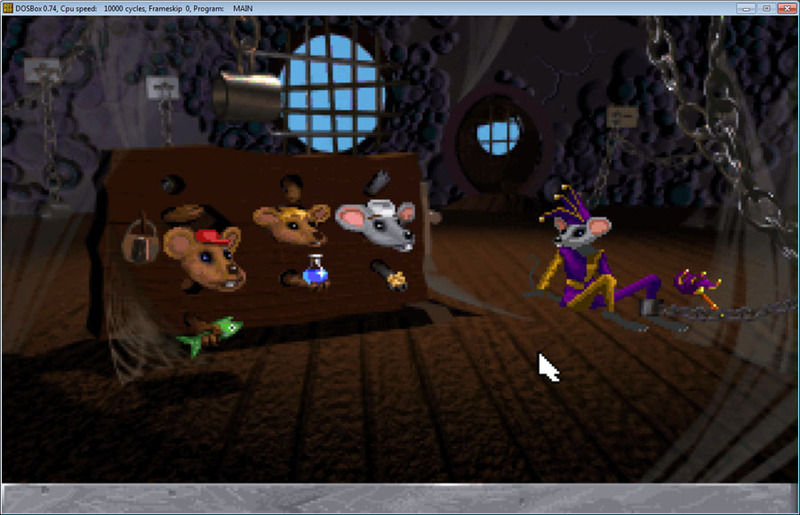 I remembered that you need staff to escape prison after being turned into mouse. Checked how game solves situation when you don't pick up staff. Well, it just places it near you upon arriving in prison (facepalm). I was wondering about that. It seems after K1 they started making sure you couldn't make the game unwinnable (unless there's something in K2 I can't remember). Seems like a very small time save anyway. I was wondering about that. It seems after K1 they started making sure you couldn't make the game unwinnable (unless there's something in K2 I can't remember). Seems like a very small time save anyway. Great job on the run!